We are excited to release the newest Air Cushion for advanced wound care treatment. This "on the go" air cushion is loved by both patients and care takers. 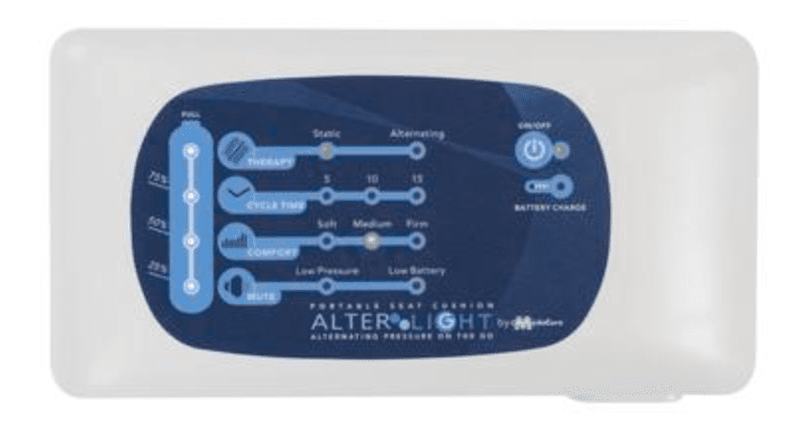 The Alter Air Cushion combines Alternating Pressure with Low Air Loss giving patients the ability to move freely indoors and outdoors without being confined to bed. This air cushion is designed for use with wheelchairs, geri chairs, or recliners. Some patients use it as an option for traveling in the car. 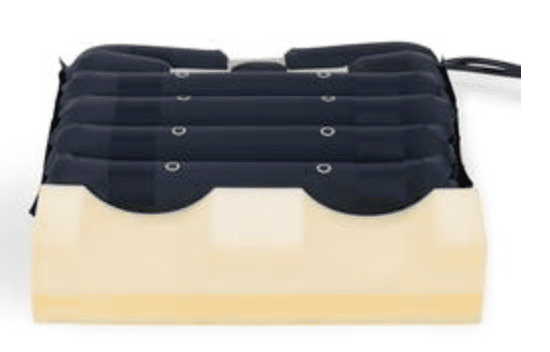 The portable cushion is light weight and is often used as a day time solution for patients that no longer want to feel confined to their beds. This cushion comes with a light weight rechargeable air pump and carrying case. How does the Alternating Pressure Cushion work? 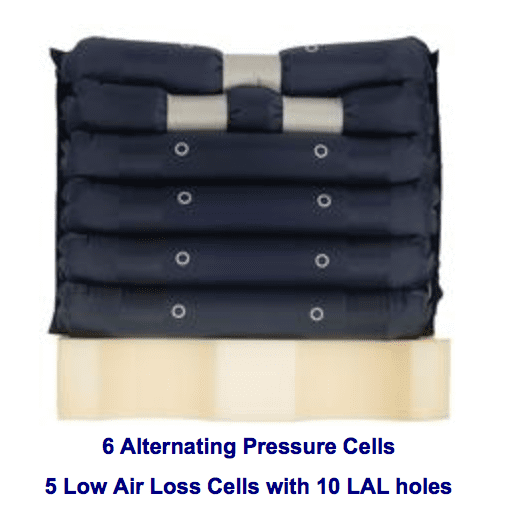 The air cushion uses 6 nylon cells that alternate under the patient. The air cells operate on a 5, 10, and 15 minute cycle time providing different intervals for pressure relief. The alternating pressure mode promotes blood flow to the skin to prevent and heal bedsores. 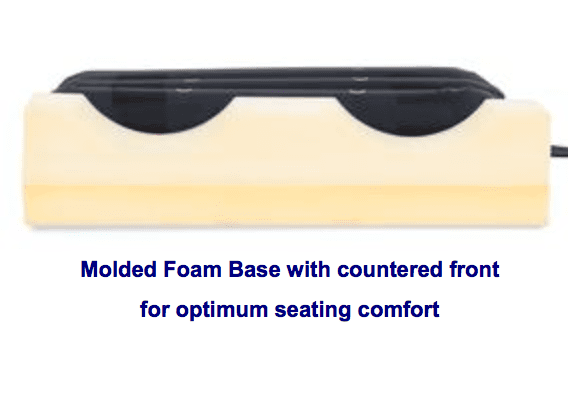 The molded foam base is easy to clean and offers the proper positioning making sure the patient is seated directly on the air cells for treatment. 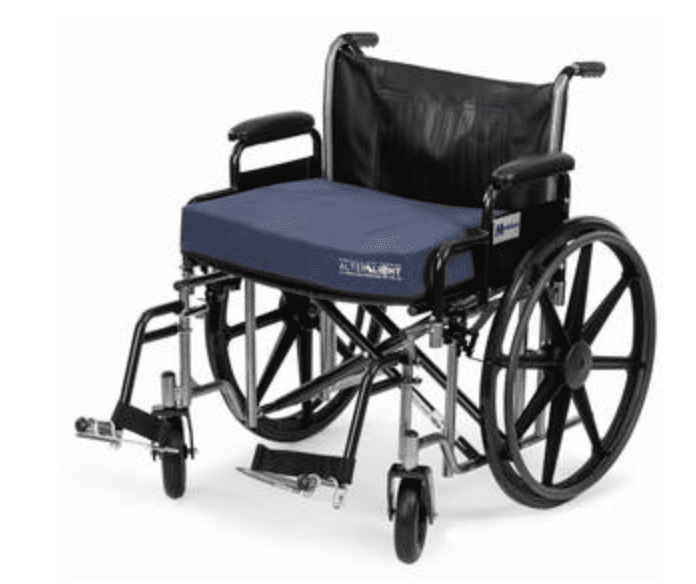 Low air loss in a wheelchair cushion? This is the only air cushion that offers low air loss combined with Alternating Pressure. The Low Air Loss circulates fresh air through 10 laser cut holes in the cells. Low Air Loss therapy is used in many hospital air mattresses. It provides a cooler seating surface reducing heat and moisture on the patients skin. (18" W X 18" L X 4" H) / 300 LB. WEIGHT CAP. (20" W X 18" L X 4" H) / 300 LB. WEIGHT CAP. The pump can easily be adjusted by the push of a button. Low, Medium and High pressure adjustments provide the right comfort settings for each patient. Width: Available in 18", 20"